From the swamplands to the mountains, green pastures, holm oaks, cork oaks and chestnut trees form a balanced ecosystem known as the dehesa, where our herds graze. 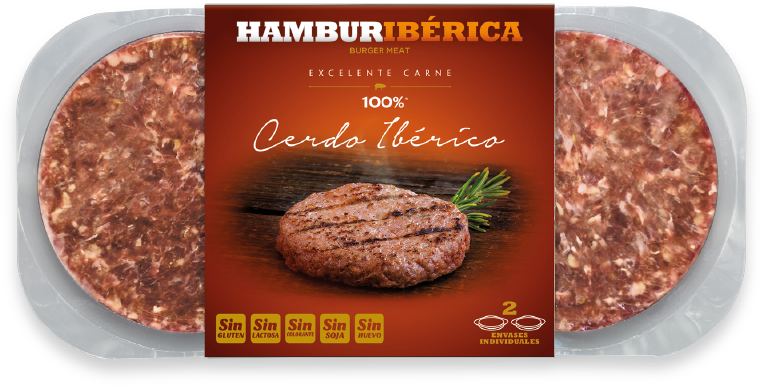 The excellent meat in our hamburgers comes from the dehesas of the southwest of the Iberian Peninsula, the natural origin of culinary delights and an unequalled environment for breeding the best free-range livestock. Excellent meats – forequarters, hindquarters and sirloins – contribute unique flavour to the hamburgers that can be tasted from the first bite. without losing the essence of the original taste of good meat. 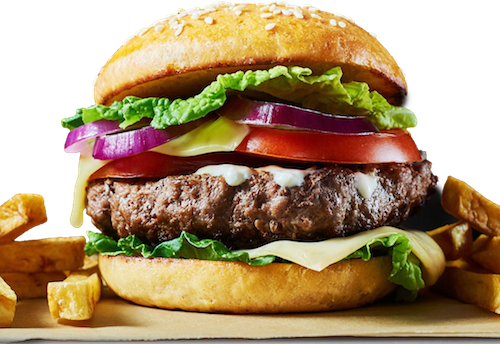 Our flagship hamburger with tender meat, very low fat content and made with olive oil. Comes from heifers that range free on the finest dehesas. Only 129.7 kilocalories per 100 grams. Available in 130 grams and in XL size for the demanding meat lover. The best moments are always shared and Hamburdehesa makes them unforgettable and tasty. Enjoy a delicious, healthy experience with our easily transportable container. Cuisine that pleases everyone, ideal for your time with friends and family. 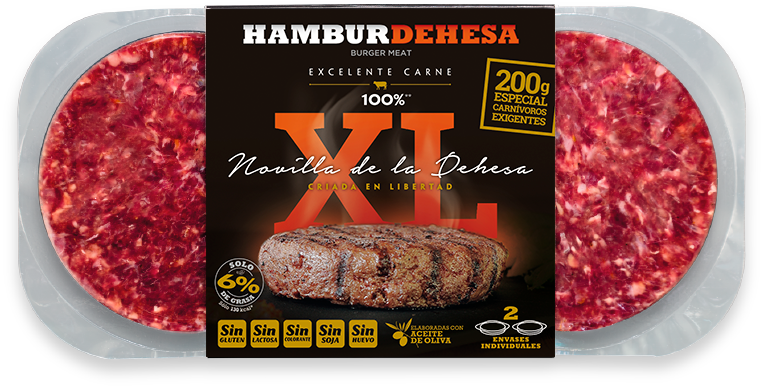 The best meats have their own breed and Hamburdehesa provides a gourmet selection for lovers of real beef. Retinta and Angus beef with supreme quality meats that make truly excellent delicacies for their aroma, juiciness, texture and flavour. A pleasure for the senses. Eating well, easily and with authentic flavour also means a healthy and varied diet. 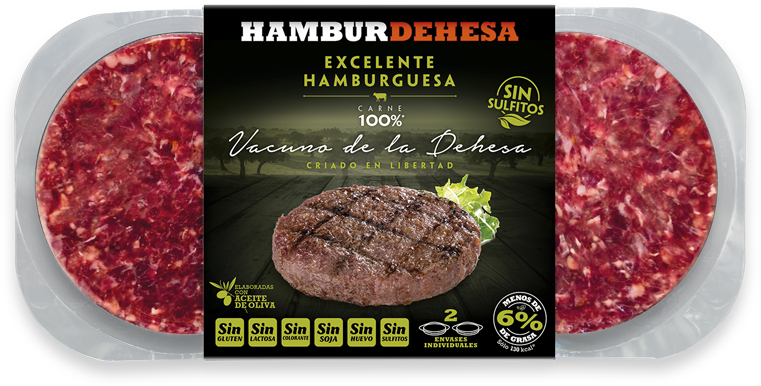 Hamburdehesa combines perfectly with numerous vegetables, cereals and natural sauces and provides the proteins required for a balanced diet. If you are concerned about your health, have an allergy or simply want to know how many calories there are in each product, the following is a detailed analysis of the allergens, calories and nutritional values in our product. The king of the dehesa, the Iberian pig, also has its Hamburdehesa: the Hamburibérica. A meat characterised by its excellent flavour full of nuances and aromas, the secret of which lies in the free-range breeding and natural feeding of our 100% Iberian stock. Hamburdehesa is synonymous with variety, quality and good cuisine. There are hundreds of ways to prepare it and thousands of combinations with ingredients from brands of recognised prestige. 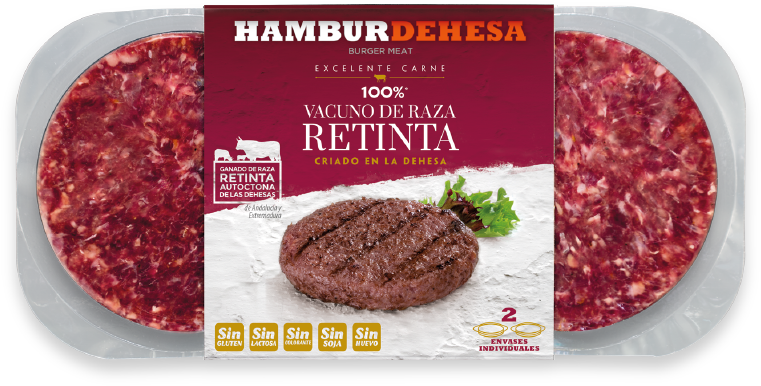 Hamburdehesa is the best choice to cook with high-quality seasonal products. The best option for your barbecue is a 130-gram hamburger or the 200-gram XL hamburger. It has never been so easy to make the barbecue a success. Authentic breed meat that makes charcoal grilling easy and gains flavour and texture over the embers. 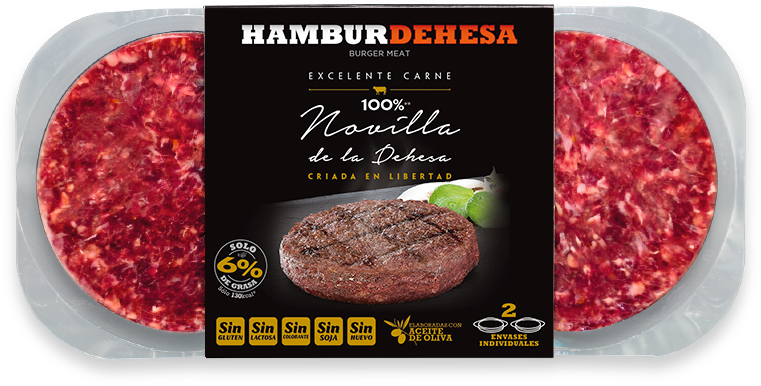 There is a Hamburdehesa in HoReCa format for professional use. Nothing can beat Hamburdehesa for customers who appreciate the taste of the authentic to which each chef can contribute their personal touch and cooking style. The individual hermetic packs enable and ensure the best conservation. We search for the best farms in the best dehesas. We select the cuts on our own premises.  We choose the best ingredients with special attention to avoiding allergens. We elaborate and package like nobody else and take special care to provide a unique product. All this enables us to proudly bear the IFS FOOD quality certification. We package like nobody else. 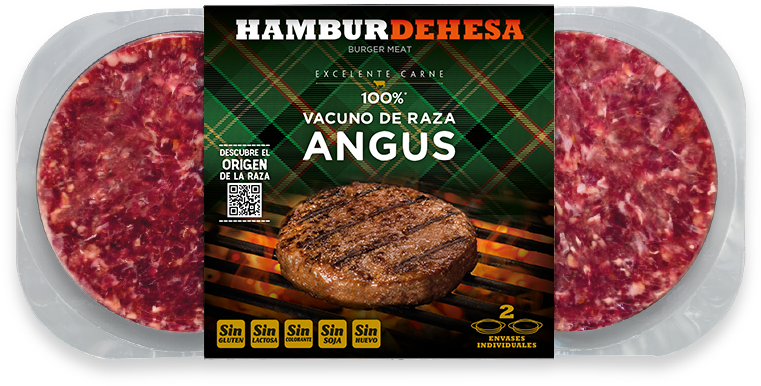 Our innovative individual vacuum-packed packaging system ensures the quality, alimentary hygiene and a longer useful life of the Hamburdehesas – up to three times longer than the conventional containers on the market. Designed to enable you to cook at your own pace and avoid wasting food. Find recipes, tips, articles, news, contests and gifts on our blog. Watch our tips videos and learn more about meats, breeds, ingredients, preparations and complements. Discover all the secrets of the genuine country hamburger.